Aizu lies northeast of Tokyo, about three hours away by train. It abounds in nature and has four distinctively colored seasons, but it is also the birthplace of Aizu lacquerware － traditional lacquerware craft with a history of more than 400 years. 2006 was the year a movement occurred in the world of Aizu lacquerware. It was “BITOWA”, a new brand born out of the fusion between traditional techniques and modern sensibility. Since the “BITOWA” brand was created, it has been continuously subjecting itself to one question: “What is the new Aizu lacquerware?” and it has been constantly broadening the potential of the Aizu lacquerware by reflecting the contemporary aesthetic sense and lifestyle in its design. At present, BITOWA is continuing its development on three important paths: “BITOWA” － proposing a hotel-like high-quality life, “BITOWA modern” － coloring an elegant everyday life, and “BITOWA order” － a special order line. Aizu lacquerware distinguishes itself through features such as its solidity and its DÉCORations; also, it is easy to use and it has a certain atmosphere intrinsic to its beauty. To all these, it adds contemporary sensibility. This is the whole that makes “BITOWA” up. As manufacturers but also users of the “BITOWA” products, we are confidently introducing this new type of lacquerware to the whole world, because “BITOWA” allows one to feel the splendor of the Aizu lacquerware on a daily basis, and is earnestly in search of new possibilities. Enjoy a high quality lifestyle with “BITOWA”. Aizu Wakamatsu City is located in Fukushima Prefecture in the northern region of Japan. Natural beauty featuring Mt. Bandai and Lake Inawashiro surrounds the city, which is blessed with four highly varied seasons, each with their own colors. The origin of lacquerware manufacture in the Aizu area dates back to 1590. Gamo Ujisato, the lord of Aizu at that time, encouraged the development of lacquerware making in his fief. Unfortunately, internal struggles in 1868-1869, which marked the end of the Tokugawa Era（1603-1867）and the coming of the Meiji Era（1868-1912）, heavily damaged the city and the industry. By the 1890s however, the city had recovered and become noted for its lacquerware industry, the fame and tradition of which continue into the present. Looking at the future, the Aizu lacquerware industry has entered a period where a new wind of change is blowing, reflecting new needs. The skills of the industry, developed and polished over 400 years, are now being combined with new designs involving a modern sensibility. We find ourselves facing the challenge of new creative approaches. Work carried out by human hands possesses a special warm and beautiful character.For each part of the process in making Aizu lacquerware, there is a specialized artisan. 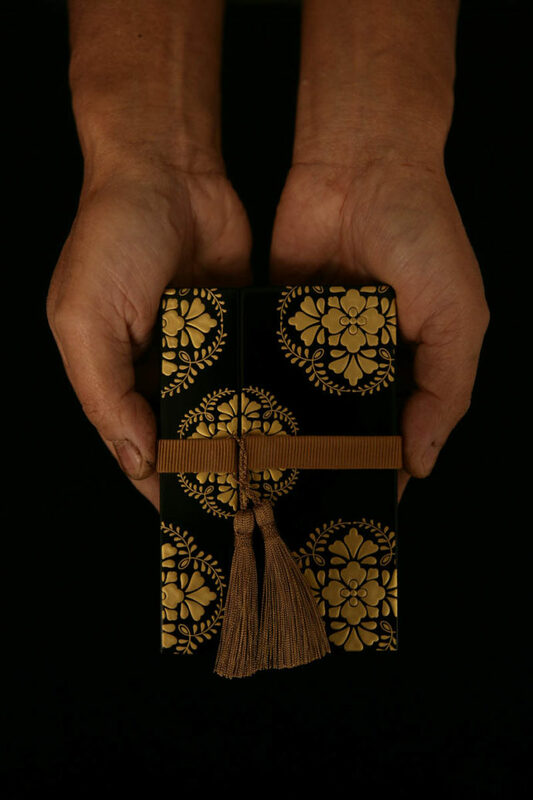 The artisan called “sowashi” assembles flat wood pieces to make boxes or trays that become the body of lacquerware. The “kijishi” does the same, but he makes round containers such as bowls by using a lathe. The “itamono-nurishi” applies lacquer only to flat parts such as a boxes or trays, the “marumono-nurishi” does this for round containers. The artisan who finally makes DÉCORative motifs on the coated surface is called “makie shi”. They create excellent piece of work through their dialog with the material, never opposing nature and time. Three special features of the Aizu lacquerware are as follows. With “hana-nuri”, lacquer that contains special oil is used, in order to create a gloss on the surface of the lacquerware. “Chinkin” is the technique that the surface is engraved with a fine-edged knife, then gold leaf and lacquer are embedded into the groove. “Taka-makie” is a high relief DÉCORation technique, which involves building up designs and patterns using two or more layers of lacquer. Thus, each piece of lacquerware is the product of the hands and hearts of many different artisans working together. After worked with the Mitsubishi Electric Appliances, had been to Finland and UK. Graduated the Royal College of Art, Ceramics & Glass Dept. MA. Work experiences in the Dartington Crystal Ltd., and the Queensberry Hunt Levien Design Partnership. Established the Kanaé Design Labo in 1999. Explored the design work from the tabletop to the surroundings. Designing tableware, Electric appliances, furniture, lighting, cosmetic packages, house hold products, products for disabilities, marketing, concept making, products development and sales strategy. 1996 Awarded the 3rd prize of the Tokyo Dome tableware festival [Japan], 1997 Awarded the 1st prize of the design competition of the Royal Society of encouragement of Arts[UK], 2004 Good Design Award [Japan]. Since 2004, Part-time lecturer in the Tama Art University (Product Design Course) [Japan], 2006 Visiting Lecturer in the Royal College of Art (Ceramics & Glass Dept.) [UK].